Skinny Man was brought to the shelter by a lady that found him in her yard. He had been hanging around for several days. She began to feed him, but could not keep him. He actually looked like a huge Old English Sheepdog because he had so much matted fur. Maybe he was actually a bearded collie or Old English mix with very long hair. His coat was so matted that you could actually knock on it and it sounded like a drum. Hard as a turtle's shell. He looked old and his eyes looked infected. I was the Assistant Manager at the shelter that day, so his fate was in my hands. I hate to ever be responsible for killing any animal, so I opted to take him to my vets to be checked out. He stunk to high heaven since there was much poop and everything imaginable dried to his matted coat. I left him for the day at the vets to examine him, get a hair cut and a bath. When I went back to pick him up the next day, it was an absolute shock. 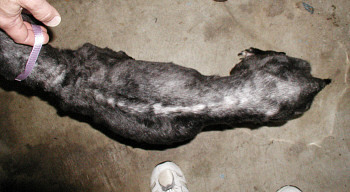 He was the skinniest dog I have ever seen. He was so malnourished that the vets felt the owner should be prosecuted. The problem was that we did not know who the owner was. You could tell by the length of his nails and the condition of his body that he had not been taken care of for a very long time. The Humane Officer at the shelter wanted to find the owner and take them to court too. He said Skinny Man was one of the worst cases of neglect he had ever seen while on the job. The vets told me that his chances of surviving were small. He needed a lot of TLC and only time would tell. I had 14 dogs of my own at the time and could not bring Skinny Man into the house with the rest of the dogs. We had an attached garage and the June weather was fine to live comfortably in the garage. Poor Skinny Man never complained about living in the crate much of the day because he was too tired to complain. All he did was eat and sleep. I took him for walks throughout the day, but he was always happy to go back into his little room and sleep. I found out that he was also deaf. You could not yell loud enough to make him hear you. That was also an advantage so he did not bark while he was in the garage. A barking dog in the garage usually meant 14 barking dogs in the house. He looked like a skinned rabbit since the vets had to take his coat right down to his skin to remove the mats. He remained a very happy and kind dog even with all his problems. He loved his walks and continued to slowly recover. It looked like Skinny Man would survive. As he became stronger, he wanted to be more active. He liked to just sit inside the garage with the door open and try to look outside. His eyes were very cloudy and I don't think he could see much either. He had a sorta "rouk rouk" bark. Very funny and strange. Maybe it was unusual because he could not hear. If he was sleeping, you had to gently touch him to wake him up. It usually always startled him, but he never growled or tried to bite at any time. He started to recover and I knew our attached garage was not going to be a good, loving permanent home for him. He need more love and attention than I could give him since I worked and had 14 other dogs in the house. I started to post stories about him on the internet in hopes someone would adopt the senior dog. Luckily, a student in Illinois read the message and posted a story about him on her college internet service. I received an email from a veterinary student that wanted to adopt Skinny Man. She told me she already had a blind Collie and wanted to adopt Skinny Man for a companion to her Collie. We talked via email and I felt this would be a good home for Skinny Man. It is often very difficult to find homes for senior dogs with medical problems. She was a vet student and would know how to care for Skinny Man. She and her fianc�e drove from Illinois to Ohio to pick up Skinny Man. It was a bitter sweet experience when they loaded Skinny Man into the car to return home. I was happy that he had a loving family, but sad to see him leave. I knew I could not give him what he needed, so a new home was the best. I received updates about how well he was doing and how he liked his blind sister. The new photos of him in his happy home made me very happy. Then, I received an email about two years after Skinny Man left us tell me he had come to the end of his life. He received a great deal of love during those two years and he deserved that love. Adopting an older dog not only gives you great love, but helps a senior live out his last years surrounded with love. First, Mark and I want to genuinely thank you for helping to bring Toby into our lives. 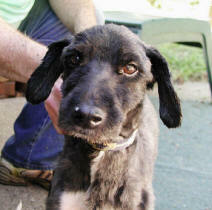 In the summer of 2004, I received your email with such sad pictures of an emaciated, shaven, black sheepdog mix. We drove 6 hours from our home in central Illinois to pick him up. He was mostly deaf, weak in his hind-end and very malnourished. As soon as he stumbled out of your garage, I knew he would now be called Toby and that he was coming home with us. I feel blessed to have had the opportunity to give Toby the home and care that he deserved for the past 2 years. He was never perfect, but always sweet and very gentle. He never barked and he always wanted to cuddle. I knew it was hard for him to get up and move around sometimes, but he always ran with such joy on his good days. Doctors said he had to be at least 12, and we would never know for sure. I will always wonder about his life before living with us, but I'm so grateful that we were able bring him comfort and joy in his final years. We said goodbye to Toby on Sunday, August 20th. His body had begun to shut down and he could barely lift his head. We knew we had to end his suffering, even though we would continue to hurt for some time. Today we are taking Toby's ashes to the park, to spread them in the pond where he stumbled and fell into the water last year. I wanted to send you this note and one of my favorite photos of Toby. I think it captures his quiet, grateful spirit.